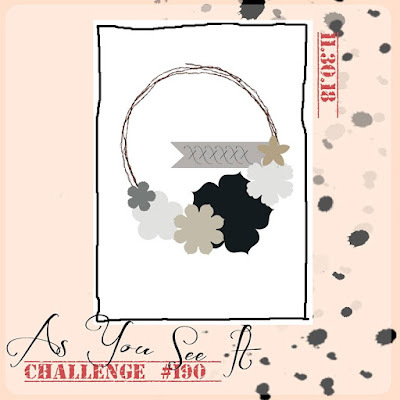 I think the circle on the As You See It sketch was meant to be a wreath, but I saw something different when I looked at it. I've put together a wedding paper tole kit a while back and have used one of the main image on a card, then put the rest of the kit aside. Today, I reached back for it and because one of the images was in a circle, I was inspired to add flowers around it and a die-cut sentiment at the bottom. Because the paper tole part was already done, this came together quite quickly. I added a few embellishments found in my stash (metal-rimmed pearl, decorative clip, brads and buttons) and I was done. I stacked the "Congratulations" die-cut three times and added Glitter Gloss Aqua Shimmer to the top one - the shimmer looks awesome on the Basic Grey cardstock. Finally, I reached for an A2 Mirror envelope to go with the silver of the card, and decorated it with a little strip from the same paper tole kit. The "Happy Holidays" sentiment was embossed in Real Red glitter embossing powder. I handdrew stitching around the main image to fill out the space a bit, added Garden Green twine and black rhinestones and I was pretty much done. The main image was colored with Prismacolor pencils. Those Littles images from Stamping Bella are adorable, and I like that they are smaller than the usual Bella images, making them faster to color. I was going through Doodlebug patterned papers recently and I put the Sweet Things papers aside, since Valentine's Day really isn't that far away. (Even though it always get lost in the Holidays crafting shuffle, for me.) I remembered that Amy R's Happy Mail theme is Love / pink and red and I got inspired to make something with those papers. There's a full sheet filled with 2" x 2" squares, so I cut out a few and used them as mty main images. 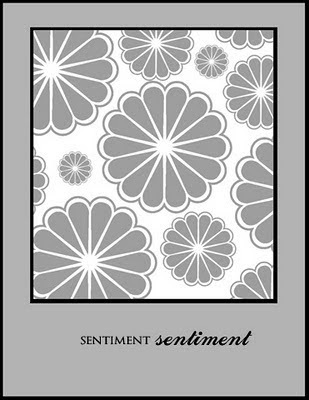 The images were matted with Silver Foil scalloped squares, and the sentiment was die-cut with a stitched square die. I also recently acquired glimmer paste in a red hue, thinking it would get used for Christmas project, but I realized it would add a nice touch to this Valentine card as well. I pulled out an old stencil from Stampin' Up! called Mostly Vintage (from back when we were doing the wall stencil thing) and I added a flourish to the corner. Images were popped up on foam adhesive and I added two epoxy hearts between the ustensils and the shakers. Then I finished off the card with a few gems and iridescent bubbles. Easy-peasy card! Drying time for the glimmer paste what was took the longest! 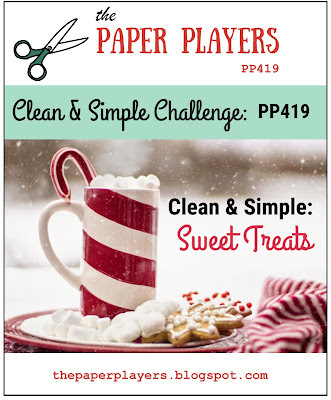 I was inspired to pull out my Holidays Catalogue supplies to make a card based on the Paper Players sketch. 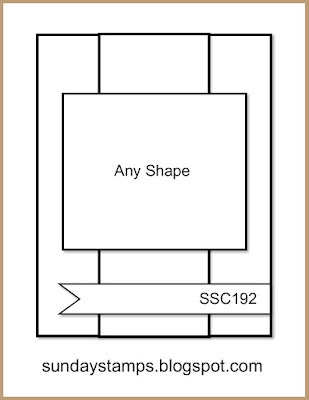 I figured I could use the long rectangle from the Stitched Labels Framelits to make one of the rectangles from the sketch, but when I pulled out the dies, I realized the rectangle was much smaller than from my memory! To solve my problem, I simply cut it twice to elongate it behind my main image. 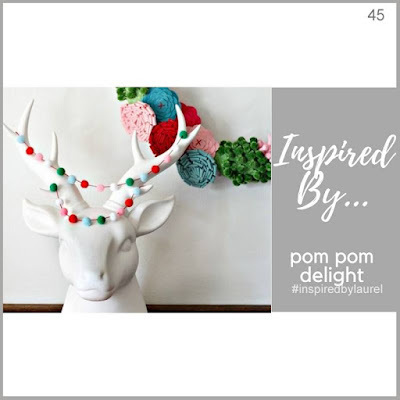 I was going through stamp options for the main image and when I spotted Feathers & Frost, I decided I wanted to use the wreath again and that it would pair beautifully with the Joyous Noel Specialty Designer Series Paper. (This one already sold out, and I'm not surprised - it's so gorgeous and elegant!) I stamped and embossed the wreath on watercolor paper using Copper embossing powder and I colored the image using Tranquil Tide, Merry Merlot amd a soft wash of Sahara Sand in the background. I stamped "Joy" from the same stamp set in the center. The green rectangle looked a little too solid on my card so on a whim, I reached out for the Curvy Corner Trio punch, and I was very happy with the result - and then remembered that this punch is long retired. Not a big deal, but I'll be sending this card to a downline member so I was trying to use current stuff. I wanted to have something poking out from behind the main image and I tried out the Sprig punch but I was not liking the result, so I tried out the Pretty Pines Framelits instead, which I liked better. (I did end up using the punched Sprigs as well, but I snipped them in two, to keep only one branch, which worked better.) Because the Pretty Pines Framelits were out, I thought I could top my image with a die-cut bow as well, and I was looking for something dimensional to put in the center of the bow. I finally found what I was looking for in the Faceted Dots embellishment pack - the dot is Blackberry Bliss, but it suits the Merry Merlot cardstock very nicely. By the way, I wanted the bow to be a little higher than my stamped piece but I didn't have the patience to trim little mini Dimensionals to this small of a size, so to make my life easier, I just die-cut three bows out of cardstock and stacked them with precision glue. This makes the bow stand out without having any Dimensionals showing. This card is better enjoyed in person, as you can fully appreciate the gold accents on the paper and the watercolored piece. Very elegant! Black Friday 25% sale = new set of 36-color Gansai Tambi watercolor coming home with me. I really wanted to test them out, so I looked for something I could do watercolor with. The Cute Snowflakes stamp set from Simon Says Stamp had been set aside in the hope that it could be used for holiday stamping this year, and doing an emboss-resist technique seemed like an easy, fool-proof way to test the watercolors out. I was inspired to use snowflakes dies peeking out of the main panel to mimick the doily from the sketch, and I wanted my panel to have a central sentiment with snowflakes around it. I found a sentiment that comes from a Christmas song and that refers to the wind. Seemed appropriate to go with the snowflakes, so the sentiment was embossed in Platinum powder, and the snowflakes in clear powder on watercolor paper. I needed colour inspiration so I did my usual trick of picking from an old ColourQ combo. I mixed the watercolors on a plastic sheet to match the combo as closely as possible and I added touches of white gold for shimmer. The snowflakes were die-cut out of Orchid glimmer paper that I've had for over a decade. I embossed the background with the Winter Snowflakes 3D embossing folder from Sizzix and matted my main panel with Certainly Celery cardstock. I was liking where the design was going but then I remembered that the sketch had three diagonal lines on it. I started playing with ribbons and fibers and found three in purple hues that matched the combo. I put them in place, glued the embossed cardstock on the card base and the panel with Dimensionals. Then I looked at the result and I couldn't help but keep thinking the fibers were distracting and that I liked the card better before I had added them. After a bit of internal debating I decided I wanted a card I enjoyed, so I gently pulled the main panel up and ripped the fibers off of the card. I'm much happier now. Vintage Drops were added in a few spots and Fresh Snowfall Glitter Drops all around the embossed background like falling snow. A little while ago, I figured out that the Picture Perfect Birthday stamp set had a bow image in it that could be used on Christmas projects to make a Christmas present bow. I got really excited about this idea, pulled out the stamp set from my stash - and realized that the bow image is quite small. Somehow, it was bigger in my mind, so the idea of doing a gift on a whole card front was not working because the scale was off. So I put this idea to the side and worked on other projects instead. 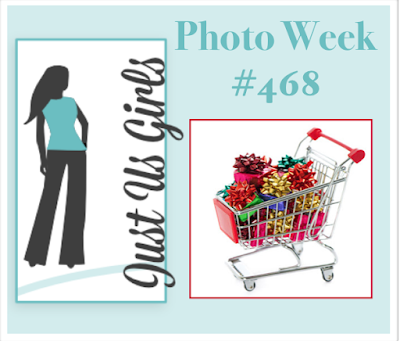 Enters this week's Just Us Girls challenge, with a little cart filled with present bows. When I saw the pile, I realized I could recycle my bow idea, but stamp a whole bunch instead of just one. That got the inspiration going again, so I pulled out the stamp set, paired it with the All is Bright Designer Series Paper and the Sunday Stamps sketch and in no time, I was going on my project. I need cards for my downline members, so I decided to make two of the same design at once. For the sentiment strip, I was looking for a long sentiment to stamp on Crumb Cake cardstock, but then I spotted the brushstroke Noël in the Christmas Pines stamp set and I decided to stamp and handcut it, then layer over a strip embossed with my beloved Corrugated embossing folder. I initially planned on doing two sentiments differently, just because I sometimes like to test out two options when I do duplicate cards, but I really liked the handcut Noël so I stuck with that idea for both cards. The only difference is that I glued everything in place on the first card and realized I could have put something beside the word, so on the second card, I added a galvanized button on the strip before adding the word. I didn't have enough room on the first card, so I added a piece of plaid washi tape instead. The main image was matted with green glimmer paper die-cut with a scallop square die, and I added red rhinestones between the bows to fill up the space and add a bit of pizzazz. The red strip of paper is embossed with the Swirls & Curls embossing folder (although it's hard to tell once everything else has been added on top) and I added a piece of white polka dot tulle ribbon as well (probably my favorite current ribbon - so delicate, goes with everything and ties very nicely). I stamped the bow in a row in all three colours to decorate my envelope. This project started as a joke. My mom loves cooking now that she is retired, especially cookies and treats. She would love for me to share this interest, but I have zero interest in cooking of any type. She was hoping that I might pick it up so that I can bake cookies with my niece and she's even purchased a few things for me in the hope of sparking the interest, but to no avail. Because it's something that she's mentioned a few times, when I purchased the Fresh Baked #1 dies from Tim Holtz, I quickly put together a set of cookies one weekend my mom was visiting and put them on a little plate, on the table. When she came to the kitchen, I told her, "Since you were hoping I would make some cookies, I've made some for you." This cracked both of my parents up. I think they turned out better than I initially envisioned. The list of supplies is quite long considering I've only made five tags, mainly because I looked through various stamp sets to find sentiments that fit the images and space available. Those would have taken forever to finish had I made the cookies today as well (they're adorable, but there's a lot of small details to die-cut and glue! ), but since that part was taken care of previously, it seemed less daunting. That's the part that affects pricing, though: You can make those tags out of a few tiny scraps of cardstock, but assembling the die-cuts can easily take a couple of hours. Fun detail: I used fun foam for the snowman, Santa's beard and hat trim and the mitten trim. It gives the images dimension and it looks just like fondant! Avery Elle has this adorable stamp set called Christmas Magic that I picked up and looked at every single time I stopped at my craft store, and the 25% offered for Black Friday finally did me in. My niece it still very much into unicorns - it was her birthday party theme, so this will make a great Christmas card for her. For the last three or four years, I've been making a card "from Santa" for her and hiding it into the full-size wooden mailbox I have at home. She's loved that thing ever since she was a toddler and the first thing she ever did when she came over during the month of December was look inside the second she came into the house (I usually keep it by the door). So the last time she came over to craft with me, we were quietly working on our project and out of the blue, she looked at me and said, "Those Santa cards I receive every year are really from you, aren't they?" I hadn't seen that one coming and that threw me for a loop. I quickly recovered and said something about the elves being crafters as well and making the cards for Santa to go with the toys. I have no clue if my answer was satisfying but she didn't say anything back. Flash forward to a couple of weeks later, during her birthday party. The whole family was having dinner at my sister's place. My sister and I were sitting at one end of the table, Megan at the other end. Everyone was having different conversations, so I told my sister about Megan blurting out this question about the cards being from me. I knew she was not listening to us when I started the story, but it appears that sometime along the way, she picked up on the fact that we were talking about her and started listening because at the end, she told me, "I know you are making the cards because you smiled when you told the story." Oh my gosh! I'm both extremely pleased by how wise she is and how good she is at reading up cues, but this is also making our job harder, trying to keep up the Christmas magic alive. My sister is planning to bring back Gaston, the Christmas elf that has been visiting each year, and I'm curious to see if she will be questioning him as well. My colleagues told me that it was normal for kids to start questioning the existence of Santa at 7 or 8, but she just turned 6, so it seems like she's ahead of the ball. That being said, I still made a card "from Santa" for her as she loves everything handmade and I suspect she'd be really disappointed if there wasn't anything in the mailbox waiting for her. I'm giving this a try and we'll see what the reaction will be, but this time, I know that my poker face better be ready to kick in gears! 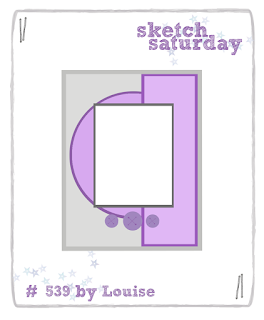 When making my last card, I had pulled out my Doodlebug paper stack. and I had put the Polar Pals papers aside, hoping to work them into a design. The colors seemed great for a snowman and a unicorn, so they became my starting point for the card. I liked the three panels of the Clean & Simple sketch, perfect for my three images. Because I wanted to use stitched squares, the ones I had were too big to put three in a row side by side, so I overlapped them a little to make the sizing work, and I covered the seams with the unicorn and the lamppost so you can't tell anyway. The three squres were inked with Distress Oxide inks (in Broken China, Wilted Violet and Hickory Smoke), stamped with snowflakes and then I added iridescent bubbles, stars and star sequins. The unicorn was covered with Glitter Gloss Aqua Shimmer as I imagine a magical creature would probably have a nice natural shimmer. 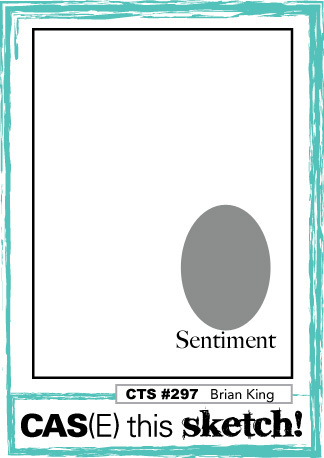 And for the sentiment, I found a "Naughty / Nice" sentiment in the Tags & Tidings stamp set (Stampin' Up! 2018 Holidays Catalogue), which I topped with a blue-green gem. The ribbon below is a white shimmery ribbon. I was eager to try out the new Fold-Up Tags Die-namics from MFT. I liked the size and the idea of having a fold to hide a message inside. I pulled out some paper scraps (Merry & Bright from Carta Collection, a 6" x 6" pad I've had and used for years and that still have quite a bit of paper left in) and tested the dies out. The next day, I started looking for images that could be added to them. I spotted an older Stampin' Up! set called Color Me Christmas and decided the bold images would look great on tags AND be fun to color with my newly-acquired Polychromos pencil set. 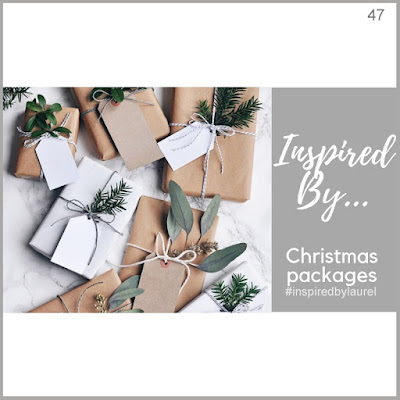 I stamped To: and From: inside the tag using the Signs of Santa stamp set, and I added some gems (including some clear gems over the ornaments in the Christmas tree), twine, ribbon and a mini jingle bell. I also put some highlights on my colored images using some Copic Opaque White paint. This is a second image that I colored during my parents' visit. 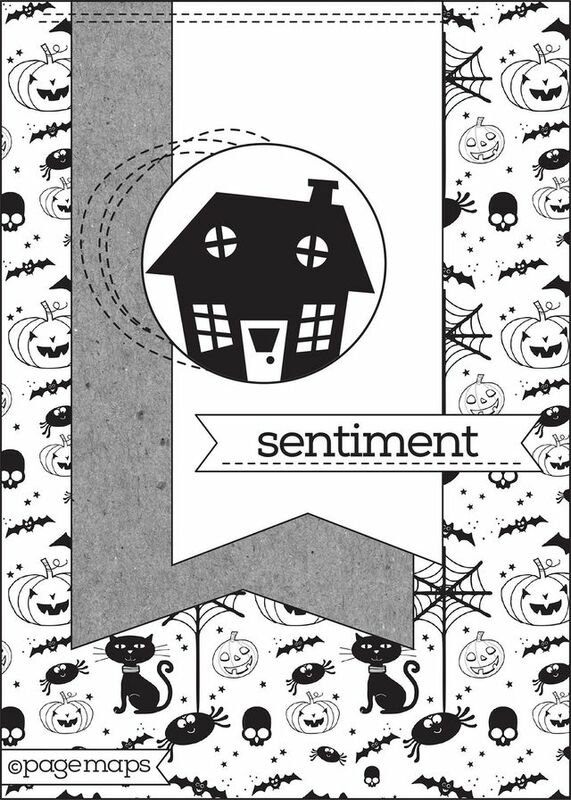 I started my design using the Try Stampin' on Tuesday sketch, although it's not necessarily super clear when you first look at the result. I didn't want to cut my elf image apart, but the fact that there are three elves reminded me of the three boxes on the sketch. So I used a Nestabilities die instead to cut out the existing image, and I did the trick of handcutting the little pompons by hand and tucking them out of the die before running through my Big Shot to have those details hanging out of the frame. This is a trick I've always loved doing to give a card a little extra something. For the last card I finished with the colored images, I had used patterned papers that had some olive green in them, so they weren't a perfect match to my coloring. This time around, I wanted something with more of a apple green in it, so I left my 6" x 6" paper pads and went looking through my 12" x 12" papers instead. I found some Doodlebug papers from the North Pole collection that were just perfect. The way I did the papers is true to the sketch. But then I needed to add a sentiment, so I went looking for options and found "Handmade in North Pole" in last year's set from Stampin' Up! called Merry Little Labels. I embossed the sentiment on grey cardstock using the red sparkly embossing powder Stampin' Up! also carried last year. The strange thing is that this stamp set is meant to be paired with the Everyday Label, but when I pulled it out, I felt it was too much of a tight squeeze for the two end letters. Out of curiosity, I pulled out the Tailored Tag and I liked the result much better. (Look, the little flourish even fits in the point perfectly!!) So I used that one instead, but I layered it over a punched Every Label to make it stand out more on my design. Four little green gems were added in the corners, and because the top right corner of the image felt really bare, I pulled out the Mini Snowflakes dies and added two Brushed Silver snowflakes, topped with red rhinestones. As a last touch, I pulled out the Gansai Tambi Starry Colors set and added White Gold watercolor over the fur parts of the hats, for a bit of shimmer. My parents visited last weekend and on Sunday night, we had a bit of free time, so I lent my mom a coloring book and I stamped myself a few Stamping Bella images and we sat down to color. While I've always thought I could sit down to color in front of the TV, it's something that I've never ended up doing. It seems I always color in my craft room, where I have all of my supplies handy and good lighting. I never randomly pick colors - I always have a color combo in mind or keep the patterned papers I plan to use nearby as reference to try and match as nicely as possible. This time, though, I quickly looked at possible papers, decided on red, green and grey and went from there. I ended up with four finished images in one sitting, so you should see more finished cards coming up soon. 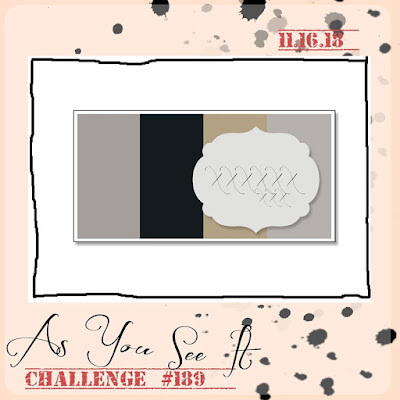 This is the first one I mounted on a card, based on the As You See It sketch (which I modified without meaning to - I didn't realize there was four panels on the original sketch and ended up with three patterns on my card!). Coloring was done with Prismacolor pencils. The cookie and milk detail was perfect for the Sweet Treats challenge as well. I had this idea of doing a long sentiment and adding two elves on each side, and the Freshly Made sketch was perfect for that. Initially, I was planning on using the elves from the Signs of Santa stamp set, but then I found two elves in the printed cardstock shapes from Pebbles' Cozy & Bright. Since I also have the matching paper, this made for an easy creation. Some cards come together easily. This was not one of them. 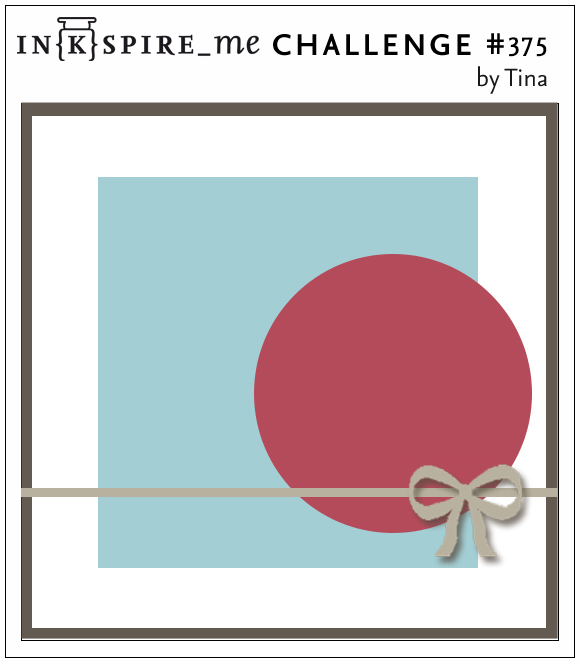 I wanted to take the new Tim Holtz domes out for a spin, so I decided to use the CAS(E) This Sketch as inspiration. The domes were a little smaller than I expected, so the card seemed really bare with just the snowglobe at the top right of it. So I added the scalloped circle mat around it, and the whole thing still felt empty, then I decided to add the big die-cut sentiment, and the layout already felt much better. The card was pretty much finished and I decided to add Crystal Drops around the snowglobe. Big mistakes. The first drops were so pointy, they looked like Hershey Kisses. No amount of tapping was flatting them out, so I decided to use a strip of cardstock to take them out and the red smeared all over the patterned paper! I tried covering it up with bigger drops, which looked like a mess, so I added more glaze to do a line instead. Urgh - the line was all wonky and messy-looking so I tore the paper off the card, used a baby wipe to wipe the dome clean (which fortunately worked) and I redid the whole die-cut circle and snowglobe base (using a wood sheet). I did the Crystal Drops around the sentiment instead and was able to salvage the card, which for a minute there I thought I had totally messed up. Lastly, I made an oversized envelope using a piece of Very Vanilla cardstock. The domes are quite high, so this will be something that is harder to mail. I might prefer to use those on tags instead. I'd also like to try gluing two back to back to make a Christmas ornament. So many ideas, never enough time to do them all. I couldn't resist the Little Snowman Agenda stamp set from Mama Elephant. It's just so adorable! I especially love the little melting snowman with the other two who seem shocked to see him like that (not used on this card, but they will be sometimes soon). I also like the snowman with the sombrero and the one with the sunglasses. With 20 snowmen overall, there's one for every taste! I DID use other favorites on this card, though: the one with the coffee cup and the one with the big furry winter hat. Because I wanted to include as many as possible, I used the Tri Window Cover die and filled the windows with eight of them. The Hugs word is included in the die set, and I decided I wanted to write "Warm Winter Hugs" using it. I found the words "Warm winter" in the Baaah Humbug stamp set from Lawn Fawn, but when I die-cut the words I added them to the word, it became hard to read, as it was hiding the G too much. I kept moving the stamped words around on the card, but it was distracting from the design rather than adding to it, so in the end, I decided to sticks with the big Hugs on its own. I had already covered the Midnight Muse cardstock with some Glitter Gloss Aqua Shimmer anyway and it had turned the blue cardstock into a midnight sky shimmery goodness, so I was inclined to not hide it. I simply added snowflake sequins instead. The patterned papers I used (I Love Winter by Lori Whitlock for Echo Park) really added a lot to the design as well. Initially, I had planned on a white frame die-cut out of thick white cardstock so that the patterned paper rectangles would really pop, but then I found this woodgrain-patterned paper in the stack and it made for the perfect frame. I glued the paper to cardstock before die-cutting it to make it sturdier and I used Stampin' Up! 's adhesive foam strips to pop the frame up. Mini-glue Stampin' Dimensionals were used to add the snowman in the frames, with one in each window popped on a double-layer to play with dimension (the heart-holding snowman and the coffee-holding snowman). Because the card is a little thick, I made my own envelope, based on the size of a 4-1/5" x 6" card even though my card is a regular 4-1/4" x 5-1/2" size. 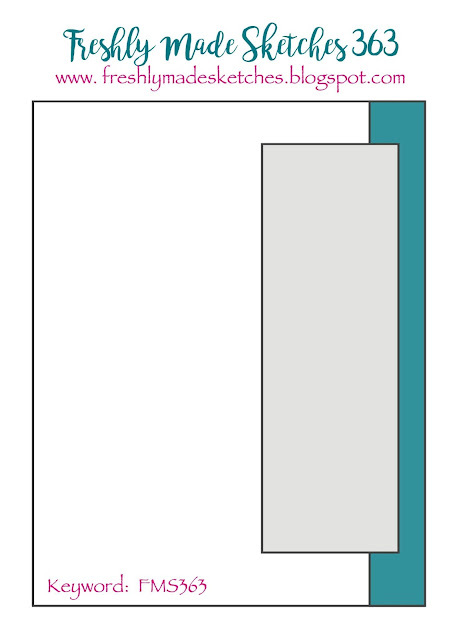 The extra room will accomodate the thickness of the card better. I used red cardstock and I clear-embossed a row of snowman at the bottom to tie the envelope to the card. I decorated the inside as well and I really like how it turned out. 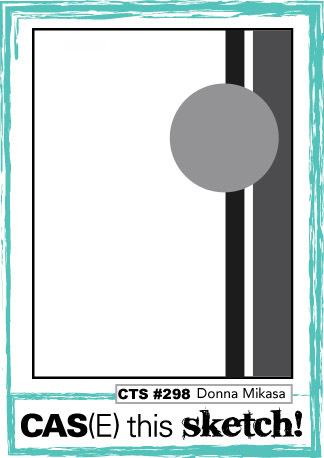 Because I had backed my patterned paper frame with cardstock, I wound up with three leftover Midnight Muse rectangles. I used all three to die-cut the HUGS word from so I could stack the letters and make them thicker. I then used the negative space from one of the rectangles, glue it over patterned paper and reused my "warm winter" stamped piece inside the card instead. I had initially stamped 9 snowmen, not knowing how many I'd fit on the card, so the leftover one was glued inside, along with a few snowflake sequins. As for the inked background, the idea came from a leftover piece lying on my desk. I had die-cut snowflakes with the Blizzard Thinlits die (Holidays Catalogue, p. 39) and I kept the negative space piece, knowing it could be reused on another project. Here, I turned it into a stencil and I used a stencil brush to add light blue ink inside my card. The result is very soft and pretty. This might be one of my recently finished card I'm the most pleased with. I wanted to use the Signs of Santa stamp set some more so I pulled it out with the matching Santa's Workshop Designer Series Paper. I then noticed that if I only pulled out the red papers from the pack, I could use this week's Paper Players color combo. Red. yellow and grey is an unusual color combo for Christmas, but by keeping red the main colour and using the other two as touches, I find that it works out pretty well. I used the Swirls & Curls embossing folder behind Santa for a windy night king of look, and I used the adorable Santa crest in the top corner to fill in the space. matching enamel shapes were also used (snowflakes and little bow). 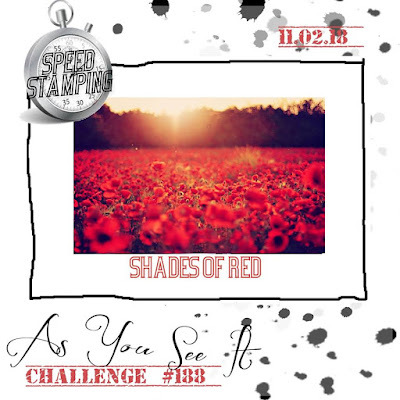 The images were colored using the Stampin' Blends markers. I'm really excited that we're starting to have a more complete range of colours, which offers more creative freedom. For the circle, I used vellum, which allowed me to mimick the sketch without distracting from the design and adding more colour. This project evolved into something much more complicated than I first intended for it to be. 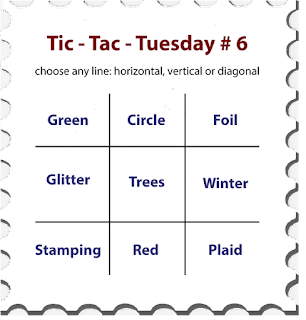 I had seen the Clean&Simple sketch previously and when I woke up, I had this idea that I could use the Crafty dies as the three elements from the sketch and Crafty Turnabout stamp to make a background. And then I got this idea to turn it into a Holidays card by stamping something like "Have a crafty Christmas." 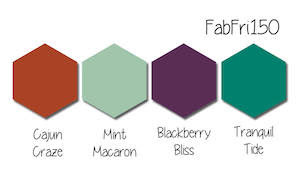 So I went looking at past ColourQ combos for inspiration and picked something Christmas-y. I stamped the turnabout, die-cut the scissors, stamp and paintbrush and assembled everything. And then I realized that the die-cuts were getting totally lost in the background! Not good. So I pulled out a sheet of vellum to solve the problem and die-cut it to A2 size using the Stitched Rectangle Stackables dies from Lawn Fawn. Then I went hunting for Christmas stamps in English. Now, I mostly stamp in French so I tend to favour French sets whenever I can. That being said, most companies offer only English sets and when I like the images enough, I will purchase the set no matter what the language is. Which means that I have a lot of English sentiments lying around. 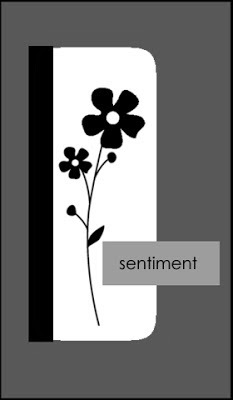 Because I am always looking for the perfect sentiment, I have compiled all of the sentiments from the sets I own into an Excel spreadsheet so I can look for specific keywords. This works out WAY better than my old method of stamping images in a binder. So today I went to my trusty spreadsheet and started looking up "have a merry Christmas" and "happy new year." I was shocked to find out how little options I had. Especially with all the Lawn Fawn sets I own, I would have expected more results to come out! Anyway, the closest hit was "Merry Christmas and happy new year" from a Papertrey Ink set, so I pulled it out, and using a marker, I crossed happy out and handwrote crafty underneath. I looked at the result and was not too happy, so I decided to use alphabet dies instead. Initially, I had planned on making an A2 card. But the more I was looking at the card, the more I wanted the wider sentiment strip and I liked having the background peek out from underneath the vellum, so I made a 5-1/4" x 5-1/4" card base. While looking for sentiment stamps, I had also stumbled unto the Stitched Rectangle Frames and decided they would look nice framing the vellum. So with all of those new ideas colliding, I started assembling the card. I was practically finished and the die-cut letters were bugging me. Too big and taking away from the visual triangle. So I carefully lifted them up and used a small alphabet stamp set instead to add crafty back in. I added a bit of red washi tape at the top because I couldn't use glue underneath the vellum without it showing and the vellum was poking up, so washi was a pretty way to solve the problem. I then added a die-cut button, a silver brad on the scissors, a couple of red gems, Crystal Effects on the little heart, button and paint, and I decided I was done. I kept thinking it was a shame to waste the die-cut letters so I recycled them as embellishment for the card. 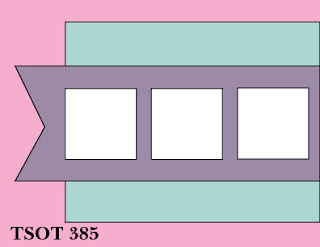 I added the little thread loop and needle from the same die set, and used the stamp rectangle for the address box. A couple of sequins from the stamp set were added as well. 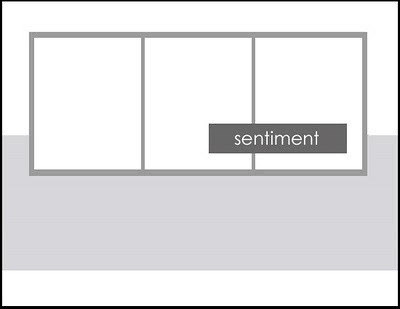 When you look at the final result, it's not clean and simple no more, but you can still recognize the sentiment banner and three main elements that were the starting point. I have been wanting the Polychromos pencils from Faber-Castell for quite a while. The big tin, with all 120 colours. I've been using my old Prismacolor pencils dating back from my high school days for coloring images fairly regularly, and I've gotten somewhat good at shading and mixing colours, but I still found it frustrating to have colors not always match my patterned papers. I think this comes from crafting with Stampin' Up! for 15 years - I expect perfect colour matches! So I've been keeping an eye out on Amazon and my local art supplies store but the price has remained pretty set in stone. The last time I was in the art supplies store, I spotted the pencils in their display case and was really tempted to leave the store with my own tin. I resisted, but they've been on my mind since and this weekend, I decided the purchase was finally happening. I had penciled in crafty time for the long weekend (Remembrance Day) so I went to the store to make my big purchase. Those big sets are tucked away, so I had to ask the clerk for one. She said she wasn't sure if they had any left, since they had sold quite a few with the sale going on (which I knew nothing about). Turns out the store was offering 25% off any purchase of $60 or more, which lowers the price of the set pretty dramatically. And I got an even better surprise at the cash register, when the price went from $300 to $165 before taxes - almost half off! I still can't believe my lucky timing. To break out my new pencils, I inked the Oddballs Santa and the Missus stamps from Stamping Bella. 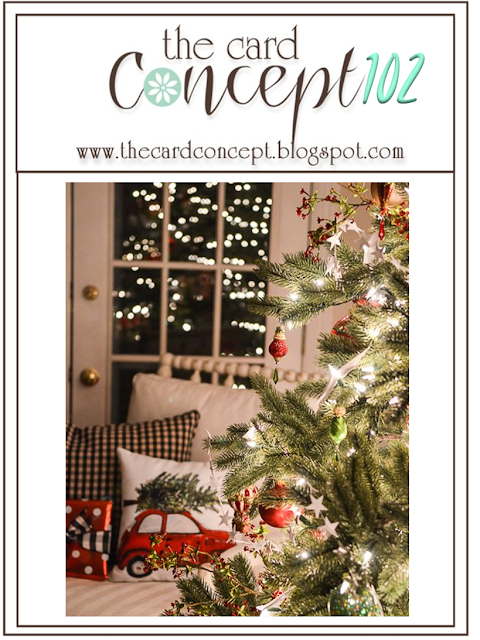 The November challenge calls for Festive cards, so that was perfect timing. I used a piece of paper from the Jingle All the Way collection from My Mind's Eye and it inspired the colours for the image. First impression of the Polychromos? They blend effortlessly. Possibly even better than my Prismacolor, as some of the colours (just a few, but still) had too much wax and created a barrier when trying to apply a second colour. Not only could I not blend a second colour with it, but I also sometimes ended up with a white spot that I was unable to colour over - very annoying. it is my understanding that the Polychromos don't contain wax, so the coloring is very even. Another thing I really liked is the metallic pencils! I used the Silver for the plate and was pleasantly surprised to discover that its colour is different from the Prismacolor one. The Prismacolor is very shiny and while it looks cute in person, it photographs really poorly and shows the pencil marks. The Polychromos Silver pencil is more of a soft grey with sparkly speckles - it looks like you have added a touch of Spica pen or Glitter Gloss Aqua Shimmer over the top. I like it! Mind you, this is the first projet I make with them so I'll be able to better judge once I've done more (I do want to test them with mineral spirits), but so far, this lady is very happy! 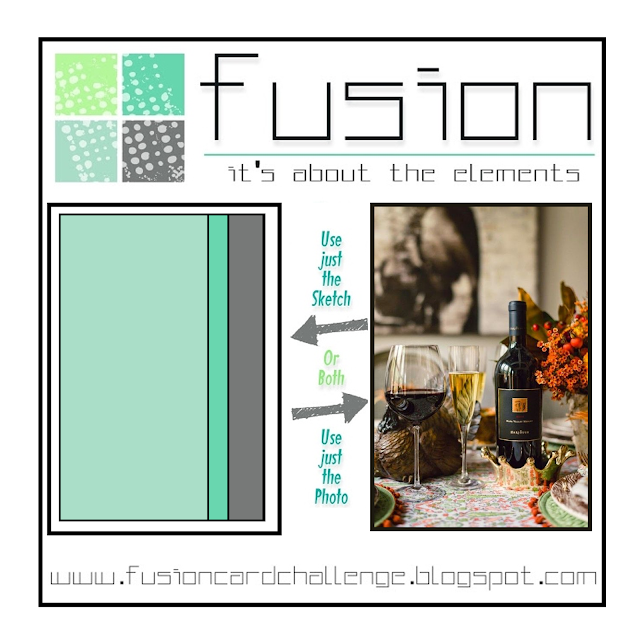 The Fusion sketch was perfect to take the Home for the Holidays dies out for a spin (!). I found some old wood sheets Stampin' Up! used to sell, which was perfect to add the car paneling. I did a bit of sponging on the edges of the snowbanks so that they would be more defined, but the rest of pretty straightforward die-cutting. I like the Fab Friday colour combo - makes for a different Christmas card, and goes well with the retro vibe of the die set. The inspiration for this card was a little random. A while ago, I had put the Survivor stamp set from The Cat's Pajamas (bought many years ago) aside to use on a card, so it was sitting on my desk. And this week, my local store made a video on pigment powders, so it made me want to pull out my Nuvo powders again. So the two products collided and I got the idea to make a bright pink panel with the shimmer powders as an encouragement card for someone who might be struggling with cancer. The sentiment I picked reads, "You're in my thoughts." I used watercolor paper, die-cut it with the Dotted Rectangle Stackables dies and masked a rectangle in the center with purple tape. I then spritzed the paper with water and added powder until I was happy with the result. I used my heat tool to speed off drying. I added thin black washi tape to frame the panel and stamped my sentiment in the corner. The bunny was stamped and embossed in black on watercolor paper and colored with inks and an Aqua Painter brush. Nuvo Vintage Drops were added in the corners where the tape meets. The colour combo was inspired by a past ColourQ combo. It's funny, the ColourQ challenges have often included mixes of pinks, which I often skipped over because I'm not big on pink. For a breast cancer card, though, pink was a must, so I went back to the pink combos I hadn't used yet and selected Melon Mambo + Pink Pirouette + Going Grey + White, which matched the shimmer powder I was planning to use perfectly. Hmm... This is the second turnabout stamp I buy and I'm still on the fence about the results I'm getting from them. Based on my so-so results with the last one, I was super duper careful when marking my X on the back on the stamp and when mounting it in my stamp platform. The first try was not good - the lining was off, but my colour combo also was not working out. So I gave it a second try and it was definitely better - but the Xs are still dancing around instead of being in a straight line and the thread is sort of in the needle, but not centered. Small details, but I've seen samples online where the stamping was more exact. That being said, the result is still pretty cute. I love all of the craft supplies and how the colors add a detail in another color on a bobbin or tube. The matching dies are also pretty great. I used the CAS colour combo and I added a neutral colour (Smoky Slate) because I needed four ink colors to complete the turnabout. Notice that little plastic embellishment with the cord at the top of my tag? I upcycled - it you've bought the new Vintage Drops from Nuvo, you might have noticed the product info is on a cute tag held on the bottle with that grey holder. You can actually unclip it, slip the tag off, and you can use it on something else. They were lying on my desk, waiting to be used on a project, and when I realized I was using grey, they became the perfect accent for the tag. The Earl Grey Vintage Drops also were! Finished card size: 5-1/4" x 5-1/4"
I wanted to play with my Polar Peek-a-Boo Pals stamp set (which I absolutely love!) and I decided to pair it with the Christmas 8" x 8" papers from Tim Holtz. The initial idea was pretty simple: use the Rectangle Peek-a-Boo Window die from MFT to create a shaker card and have one of the polar pals peeking from it. I had a hard time deciding which critter to choose, but I decided the walrus worked well with the plaid paper. The paper pad includes snowflake-patterned window sheet, which was perfect for the shaker. I was looking for a French sentiment and I decided to use a tag from the Tags & Tidings bundle, the circle one that reads "Do not open before Christmas." I threaded three ribbons (black, white, silver) in it for added texture. I added two wooden snowflakes, topped with red pearls. Initially, I was planning to use my Vintage Drops from Nuvo somewhere on the card, but because the red pearls were out, on a whim, I tried out adding the small ones all around the frame. I liked the effect, so I glued them in place with Stampin' Up! 's fine-tip glue. For the final touch, I used the Frosty Sparkle Glitter Kiss all around the edge of the card for a frosted look. I used the leftover piece from the window to decorate a red envelope to match. The starting point of this card was a video I spotted on YouTube of an artist sketching with watercolor pencils and it made me wonder if I could get an equally cool background using my Stampin' Up! watercolor pencils (she was using Faber Castell watercolor pencils). So I pulled out a piece of watercolor paper, masked the edges and scribbled colours on the paper using Pacific Point, Rich Razzleberry, Flirty Flamingo, Night of Navy and Balmy Blue. It took a few layers before I achieved this saturated look. The result is not bad, but the watercolor pencils are still not my favorite medium to use. I did find that by rubbing my Aqua Painter brush on the tip of the pencil until I built up a nice amount of pigment on the brush, I was able to transfer more colour to the page and get nice saturated colour without getting pencil marks (which tend to remain even when using a very light touch when putting pencil to paper). Based on the result I was seeing in the video, I would think there are different qualities of watercolor pencils (as with every colour medium) and because the Stampin' Up! pencils are affordable, the pigment is not as rich and blendable as some others. They are a great options for beginners to discover watercolor, but as of now, they are still not a preferred option of coloring. Another fun tip I discovered, though, is that you can get a nice splatter effect easily by flicking your Aqua Painter brush directly on the tip of the pencil over the paper! This might be the easiest way of getting colored speckles I've found so far. The branch and snowflake dies come from the Seasonal Layers Thinlits dies set. I used Dazzling Diamonds glimmer paper for the snowflakes and adhesive sheets on the back to simplify gluing them in place. I used a white gel pen to add snow to the top of my die-cut branch. The sentiment comes from the Making Christmas Bright stamp set and reads something like "May these Holidays be sparkling with joy," which goes well with the shimmery snowflakes. I'm a little mad that I got a smear on the bottom sentiment. I should have known - purple inks are always more pigmented and tend to smear more than other Classic inks, and they don't dry as fast on watercolor paper, so this is made worse. 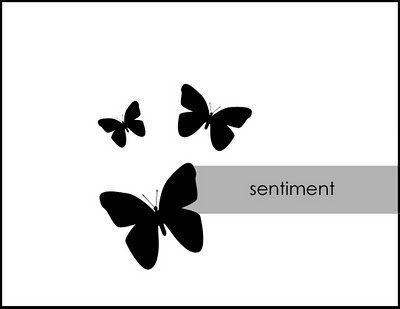 I stamped my sentiment and then cut my paper to size and that's when I smeared the ink while manipulating the paper. I decided I could live with it, so I finished the card as is. 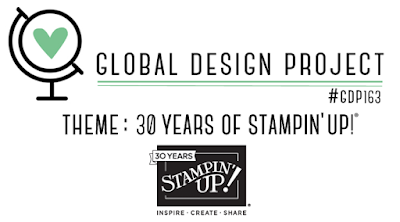 The GDP theme this week was Stampin' Up! 's 30-year anniversary. I've been making milestone birthday cards because I've recently found out that those sell quite well and I was missing a 30-year card, so this was the perfect motivation. I used the lovely gold-foiled Birthday Designer Series Paper and a Card Maps sketch for inspiration. Cue inspiration in the form of a Christmas edition of a French-Canadian magazine that I bought yesterday. There's an article in it on Santa where they have this handcut white mustache and beard on it, which caught my attention because it was paper craft. Then this morning, when I woke up, a light went on and I thought, there's my 10-minute red card right there! I have this Msutache Framelits die that Stampin' Up! sold years ago that was the perfect size and starting point for the card. The beard is simple a 2-1/2" x 2-1/2" square of Shimmery White cardstock, on which I trimmed the side to make the top narrower. I handcut strips at the bottom, rounded the cardstock with a bone folder and I snipped the ends at an angle. (The magazine one is a straight cut, but I liked the look better after trimming the ends.) At the top, I used a Small Oval punch for the mouth opening and it was ready to glue down on a leftover piece of red patterned paper I found in my scraps. I also found a leftover piece of red cardstock big enough for a card base - it was 12 x 12 cardstock initially, so I was able to use the 1" strip I cut off from the card base to die-cut my Ho Ho Ho with alphabet dies. I added Glitter Gloss to the letters for a bit of shine. Finally, I added little red gems on the backdrop and I was done! The best part of this card is that it works both in English or in French so I can send it to anyone.